The Mustajärvi Gold Project consists of an exploration permit and exploration reservations covering over 15km2. The project is flat, glacial till-covered terrain in the Lapland region of northern Finland, 17 km east of the town of Kittilä, with road and power on the property. The project is situated in the Central Lapland Greenstone Belt, which hosts several recent gold discoveries. The observed gold mineralization, structural setting and work to date support the potential for a high-grade orogenic gold deposit on the Mustajärvi property. Studies suggest there could be as much as 30 times the currently known gold resources in the CLGB1. Government geochemical sampling and geophysics in the 1980’s outlined the initial potential of the Central zone at Mustajarvi. Historically, a total of 12 (40 metre deep) holes and a small pit (20x70m) was excavated in this area (Refer to Brief History section, below, for more details). The Central Zone lies along a NE-trending magnetic low which is interpreted to represent a second order structure similar to one which hosts the Suurikuusikko deposit 33 km to the north. 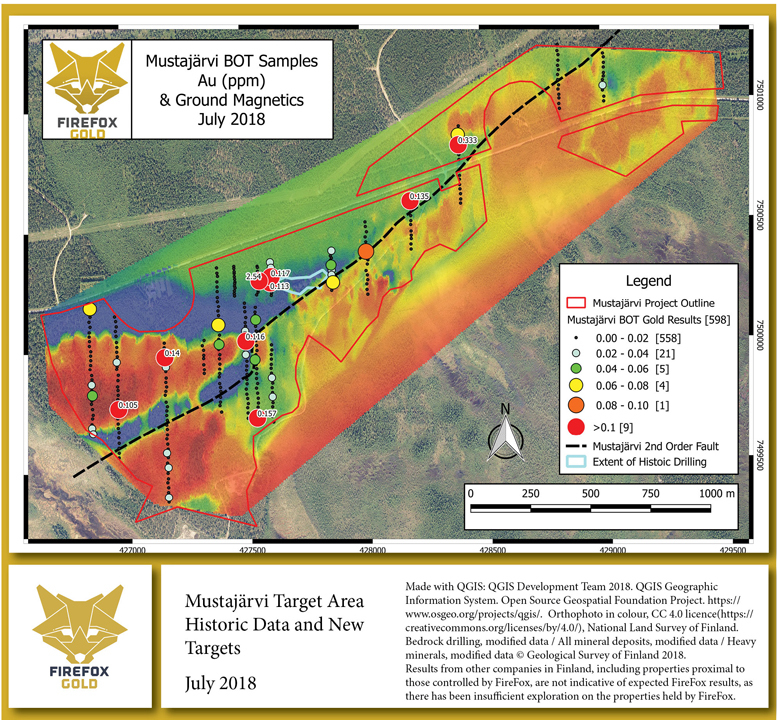 Historic sampling data combined with recent BOT sampling, channel sampling, geologic mapping, geophysics and drilling performed by FireFox outlined a 2,900-metre-long target area. This area is coincident with the magnetic lineament and hosts anomalous gold samples. It is centred on the Central Zone. In addition, chip sampling identified gold mineralization along intersecting structures and was found to be coincident with Induced Polarization (IP) anomalies. FireFox drilled the Central Zone in late 2018 and confirmed high-grade gold mineralization to greater depths than previously targeted. 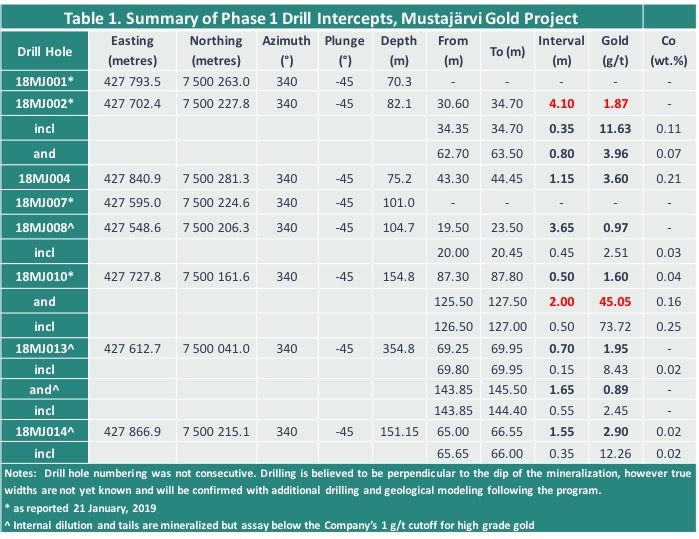 A summary of Phase 1 drill results is available here. The Central zone remains open along strike as well as to depth. FireFox is continuing systematic exploration work in 2019, including a second drill campaign. For details on the program in progress please refer to the News Releases or the latest Presentation. Highway 80, which is part of the paved Finnish national highway grid, passes through the northern part of the Mustajärvi claim between the towns of Sodankylä and Kittilä. Both towns have populations ranging from 6,000 to 9,000. Kittilä, which is 17 km west of Mustajärvi, is a winter travel destination with daily flights to Helsinki and other European cities in the winter, with fewer flights in other seasons. A high-voltage power-line also cuts through the property. There is abundant water in the area and water rights could likely be obtained for milling. Firefox Gold Corp. (“Firefox”) owns 100% of the Mustajärvi exploration permit, subject to a 1% NSR royalty payable to Aurora Exploration Oy (“Aurora”), half of which can be purchased for US$500,000. The exploration permit allows for detailed work, including drilling. Firefox owns 100% of the Mustajärvi exploration reservations. The gold potential of the Mustajärvi property was first recognized in a late 1980’s governmental till survey. From 1990-1992, Outokompu Oy carried out till, magnetic and IP surveys on the Mustajärvi prospect, following up with trenching and diamond drilling. The geophysics highlighted a NE-SW striking shear zone and the gold mineralization was found to be spatially associated with magnetic, IP, and chargeability anomalies. Outokompu allowed their mineral tenure to lapse in 1995. In the early 2000’s, small-scale miners excavated a 20 x 70 metre pit, 2-5 metre deep, along the surface trace of the main mineralized zone. Samples of gossanous material were reported from this pit by the property vendor with up to 17.4 and 79.8 g/t Au (Aurora, 2017). Well-mineralized boulders reportedly from the pit consisted of quartz-carbonate-pyrite±tourmaline veins with abundant goethite. In 2017, Aurora geologists collected grab samples from trenches and boulders; one sample of sulfide-rich quartz vein material assayed 79.8 g/t gold. While the Company believes the preceding historical drilling and sampling data are reliable, readers are cautioned that a “qualified person” (as defined by National Instrument 43-101) has not yet completed sufficient work to be able to verify the historical information, and therefore the information should not be relied upon. Outokumpu data retrieved from the Geological Survey of Finland (GTK) database. Aurora data provided by Aurora Exploration Oy. Phase 1 Drill Program confirmed historic drill results and discovered new style of mineralization at depth. Encountered first mineralization coincident with Induced Polarization (IP) anomalies. Central zone outlined along 400 metre strike length and remains open along strike and at depth. Entire Mustajärvi target area 2,900 metres long. The Mustajärvi property is located within the Central Lapland Greenstone Belt (“CLGB”), a poorly-explored package of Paleoproterozoic-age mafic volcanic and sedimentary rocks which underwent three ductile compressional events around 1.79-1.92 Ga followed by one or more brittle stages. The Mustajärvi property is located between the Venejoki and Sirkka thrust zones. A NE-trending magnetic low passes along the axis of the Mustajärvi property for 2.6 km, possibly representing a second-order structure like that which hosts the Suurikuusikko deposit 33 km to the north. The geology in the Mustajärvi area is dominated by the contact zone between the Sodankylä Group siliciclastic metasediments and the Savukoski Group ultramafic and mafic volcanics. This contact is usually gradational with mafic-ultramafic interlayers in the siliciclastic metasediments close to the contact zone. Black schists interlayered with mafic tuffs have been observed near the contact zone. The contact zone is thought to provide a major control for the gold mineralization due to the competency contrast between the lithologies, auriferous veins generally following the contact zones between mafic-ultramafic volcanics and siliciclastic metasediments. The oriented drill core, combined with the surface mapping in trenches, has provided much more insight into the structural controls on mineralization. For additional details please refer to the Technical Report. 1Niiranen,T., I. Lahti, I., Nykanen, V.(2015) The Orogenic gold potential of the Central Lapland Greenstone Belt, Northern FennoscandianShield. In W.D. Maier, R. Lahtinen, H. O’Brien, Eds., Mineral Deposits of Finland (pp733-752). Elsevier Inc.